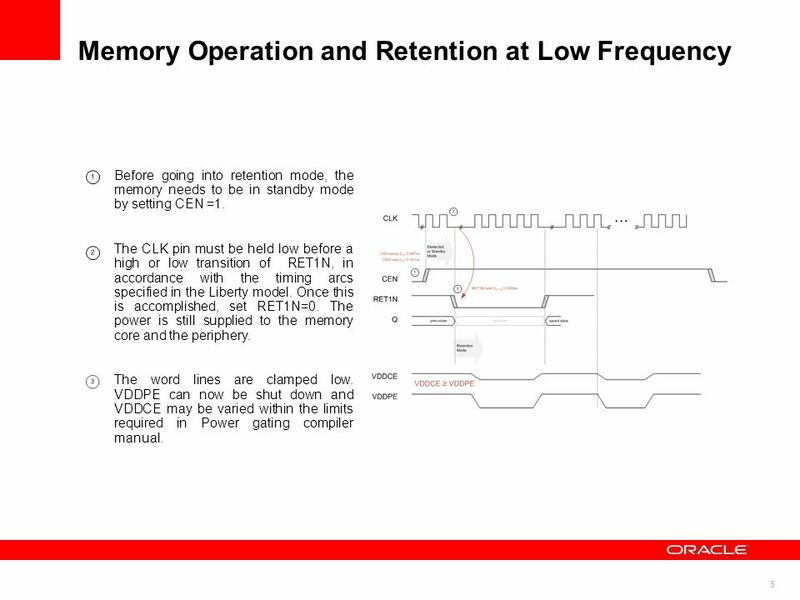 Before going into retention mode, the memory needs to be in standby mode by setting CEN =1. The CLK pin must be held low before a high or low transition of RET1N, in accordance with the timing arcs specified in the Liberty model. Once this is accomplished, set RET1N=0. The power is still supplied to the memory core and the periphery. The word lines are clamped low. VDDPE can now be shut down and VDDCE may be varied within the limits required in Power gating compiler manual. Extra margin adjustment pins provide the option of adding delays into internal timing pulses. There are three sets of EMA pins: EMA[2:0], EMAS, EMAW[1:0]. 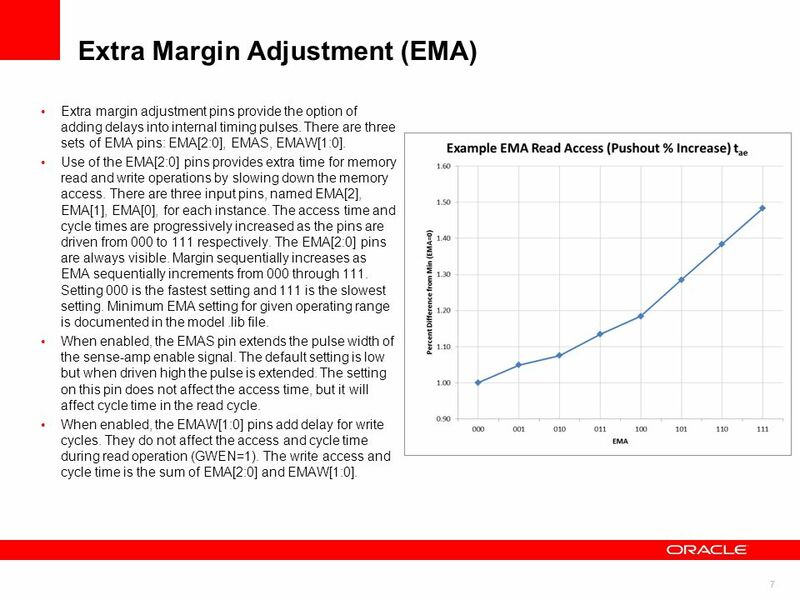 Use of the EMA[2:0] pins provides extra time for memory read and write operations by slowing down the memory access. There are three input pins, named EMA, EMA, EMA, for each instance. The access time and cycle times are progressively increased as the pins are driven from 000 to 111 respectively. The EMA[2:0] pins are always visible. Margin sequentially increases as EMA sequentially increments from 000 through 111. Setting 000 is the fastest setting and 111 is the slowest setting. Minimum EMA setting for given operating range is documented in the model .lib file. When enabled, the EMAS pin extends the pulse width of the sense-amp enable signal. The default setting is low but when driven high the pulse is extended. The setting on this pin does not affect the access time, but it will affect cycle time in the read cycle. When enabled, the EMAW[1:0] pins add delay for write cycles. They do not affect the access and cycle time during read operation (GWEN=1). The write access and cycle time is the sum of EMA[2:0] and EMAW[1:0]. You must route chip-level ground (VSS) and VDD to the memory instance and drop vias down to the m4 straps. 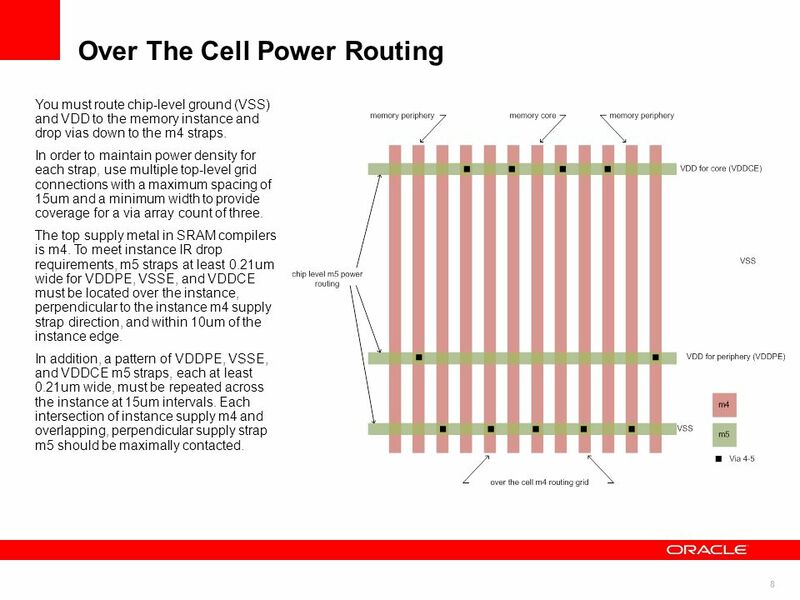 In order to maintain power density for each strap, use multiple top-level grid connections with a maximum spacing of 15um and a minimum width to provide coverage for a via array count of three. 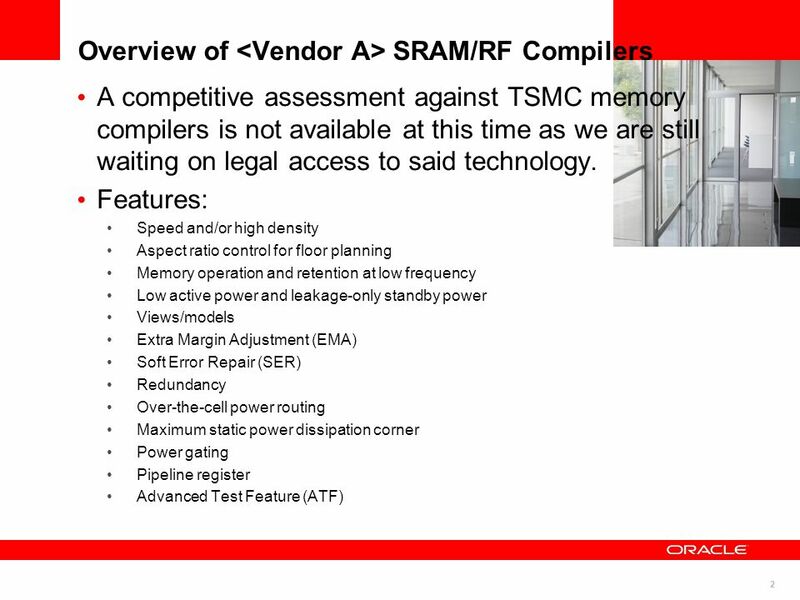 The top supply metal in SRAM compilers is m4. 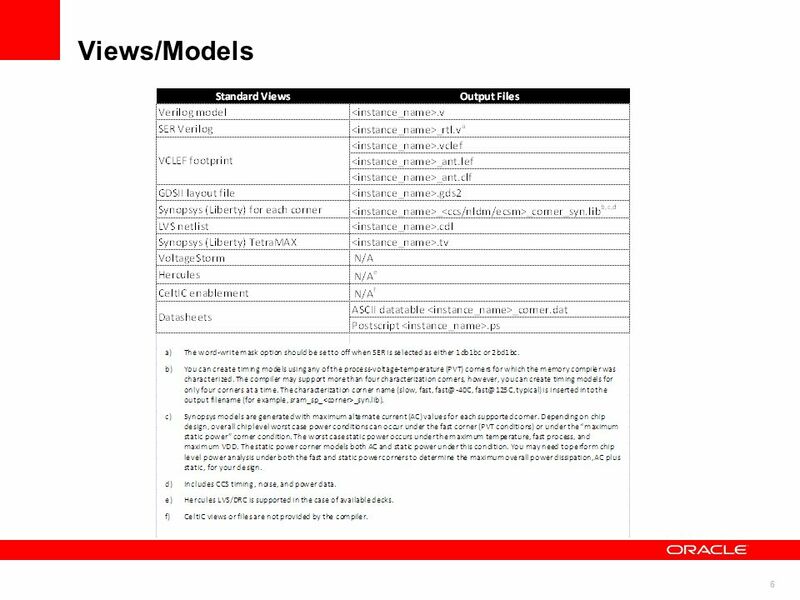 To meet instance IR drop requirements, m5 straps at least 0.21um wide for VDDPE, VSSE, and VDDCE must be located over the instance, perpendicular to the instance m4 supply strap direction, and within 10um of the instance edge. In addition, a pattern of VDDPE, VSSE, and VDDCE m5 straps, each at least 0.21um wide, must be repeated across the instance at 15um intervals. Each intersection of instance supply m4 and overlapping, perpendicular supply strap m5 should be maximally contacted. 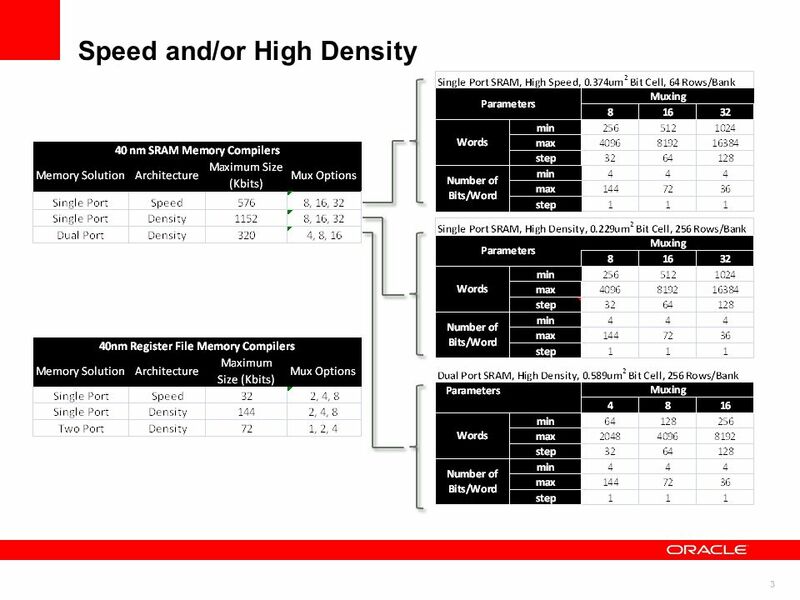 Download ppt "RAPID Memory Compiler Evaluation by David Artz"
COEN 180 SRAM. 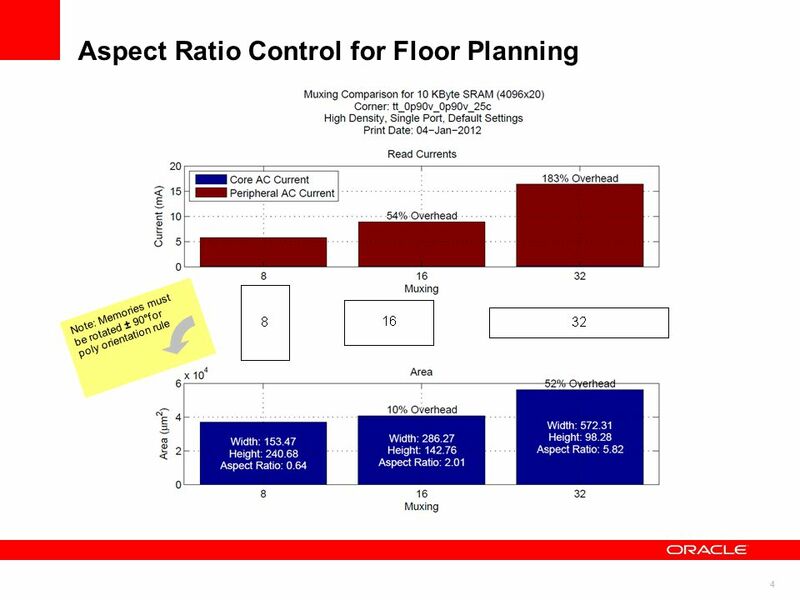 High-speed Low capacity Expensive Large chip area. 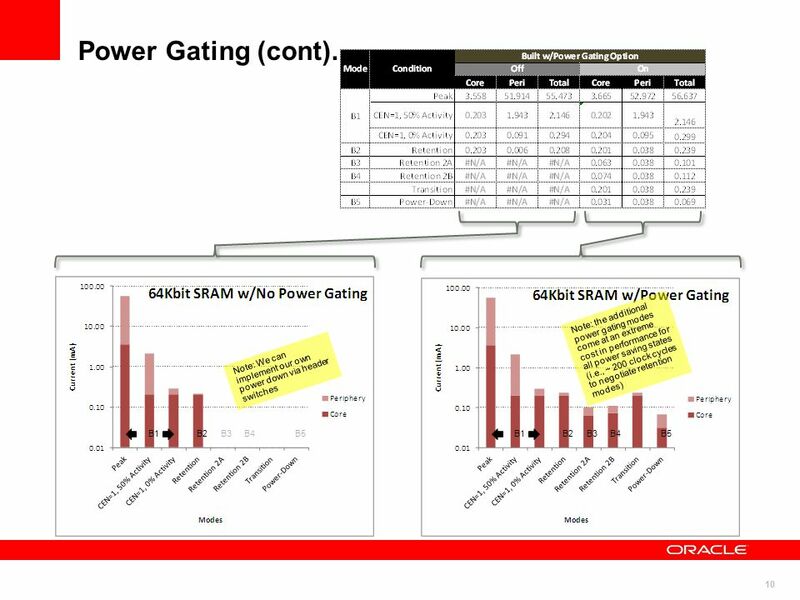 Continuous power use to maintain storage Technology used for making MM caches. Semiconductor Memory Design. Organization of Memory Systems Driven only from outside Data flow in and out A cell is accessed for reading by selecting. 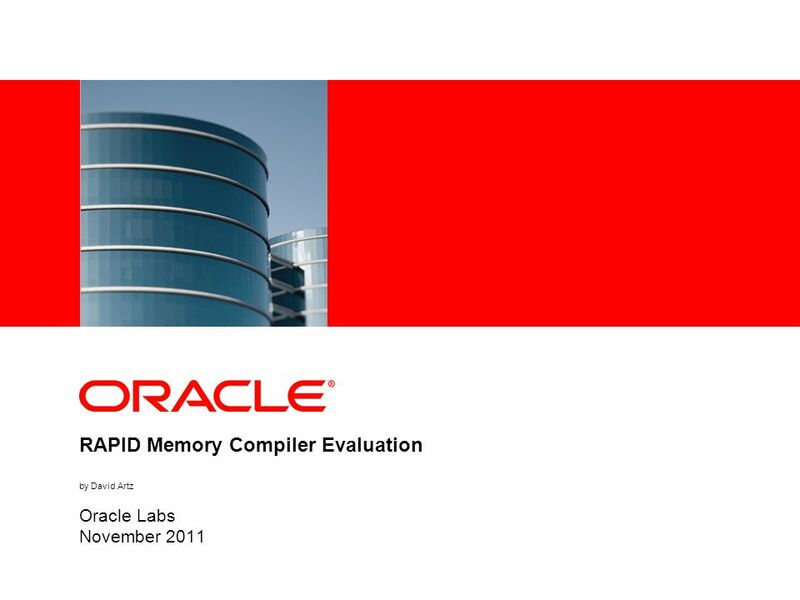 RAPID Standard Cell Library Evaluation by David Artz & Cory Krug Oracle Labs November 2011. University of Michigan Electrical Engineering and Computer Science University of Michigan Electrical Engineering and Computer Science University of Michigan. + CS 325: CS Hardware and Software Organization and Architecture Internal Memory. VLSI Design EE 447/547 Sequential circuits 1 EE 447/547 VLSI Design Lecture 9: Sequential Circuits. MICROELETTRONICA Sequential circuits Lection 7. Lecture 11: Sequential Circuit Design. CMOS VLSI DesignCMOS VLSI Design 4th Ed. 11: Sequential Circuits2 Outline  Sequencing  Sequencing Element Design. Introduction to CMOS VLSI Design Lecture 10: Sequential Circuits David Harris Harvey Mudd College Spring 2004. Sequential Circuits. Outline  Floorplanning  Sequencing  Sequencing Element Design  Max and Min-Delay  Clock Skew  Time Borrowing  Two-Phase Clocking. Low Power Memory. 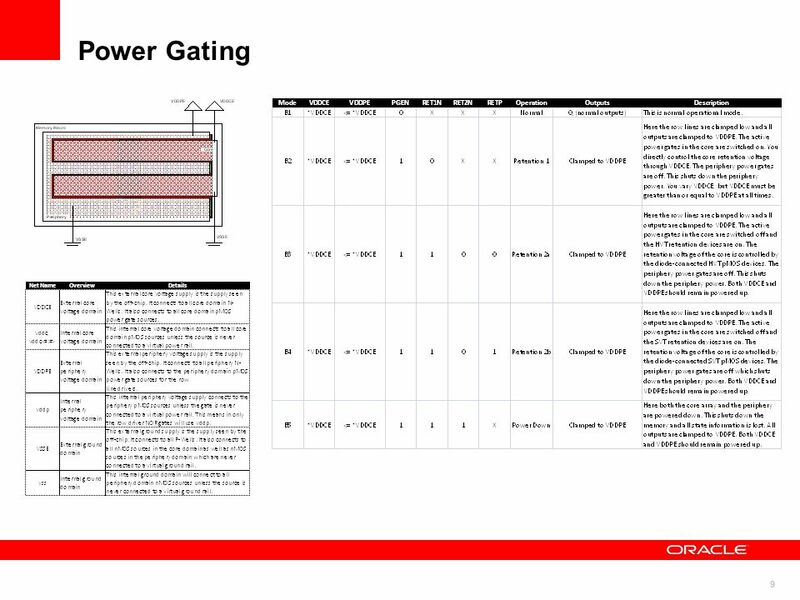 Quick Start Training Agenda What constitutes low power memory Variations & vendors of low power memory How to interface using CoolRunner-II. DAAD Project ISSNBS Niš, LOW POWER MICROCONTROLLER DESIGN BY USING UPF Borisav Jovanović, Milunka Damnjanović, Faculty of Electronic Engineering. Clock Design Adopted from David Harris of Harvey Mudd College. 1 The Basic Memory Element - The Flip-Flop Up until know we have looked upon memory elements as black boxes. The basic memory element is called the flip-flop. S. Reda EN160 SP’08 Design and Implementation of VLSI Systems (EN1600) Lecture 14: Power Dissipation Prof. Sherief Reda Division of Engineering, Brown. Huffman Encoder Project. Howd - Zur Hung Eric Lai Wei Jie Lee Yu - Chiang Lee Design Manager: Jonathan P. Lee Huffman Encoder Project Final Presentation. Registers  Flip-flops are available in a variety of configurations. A simple one with two independent D flip-flops with clear and preset signals is illustrated. S. Reda EN160 SP’07 Design and Implementation of VLSI Systems (EN0160) Lecture 13: Power Dissipation Prof. Sherief Reda Division of Engineering, Brown.